Aunt Sally has put some ridiculous ideas in Alice's head again-- this time about being the woman of the house. Plus, the boys have decided to give all the 7th graders nicknames based on topography. Elizabeth is devastated to be Illinois. Alice just hopes she doesn't end up with Wyoming. And then there's the surprise party Alice is planning for her dad's birthday. All I can really say about this is that the ending hit me like a Mack Truck and I really wasn't expecting it. Wow. 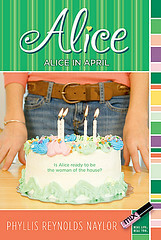 **For a few days, I had the book title as Alice in Lace, which is a later book in the series that I haven't read yet. I blame lack of sleep.